Blog from Wellington, New Zealand | Margaret in Wonderlands.. The next day we set off at 9am for Wellington. It was a 5 hour drive. I stayed in Base for the first night and then was checking into Rowenas for the next 2 nights, Nat and her friends were down there for the Kiwi music festival so I would see them on the Saturday. Also Angela was flying in Friday to Wellington so I would see her then or Saturday at least so I was mega excited. I also want to go to Te Papa museum which is meant to be amazing. It details NZ's precarious position on the tectonic plates, its birds, marine life, cultural history and a marae. It is also home to Peter Jackson and his Weta studios of Lord of the Rings. 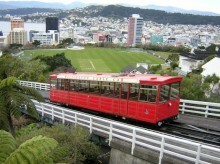 Wellington is the 3rd largest city and since 1865 has been the capital and is home of the NZ government. It is named after the first Duke of Wellington 'Arthur Wellesley' who commanded the Bristish army against Napoleon and was also British PM. The capital used to be Russell then moved to Auckland before being moved south to keep the southerners happy. It is also known as the windy city, the local rugby team is called the Hurricanes. Wind is channeled through the Cook strait which is the only gap in NZ's 1400km chain of mountains. 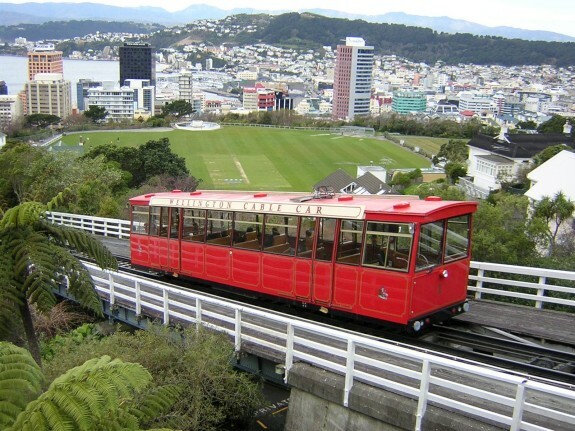 The city is also located on a major fault line and Wellington leads the world hopefully to develop and the application of technology to create earthquake resistant buildings. The habour is a large volcanic crater. We did a stop in Ohakune which is home to the carrot growing in the country. We took some funny pictures with a large carrot. Then we stopped via Waiouri which is home to the NZ army which as you can imagine is very small. They actually took away the airforce some years ago as there was no need for it. The camp is situated 815 metres above seal level so it provides good surroundings for training in.. freezing in the winter and hot in the summer. Our last stop was Bulls for lunch where I had a delicious mint choc chip flavoured ice cream... my favourite and it was home to the Dutch people.. they all settled there years ago and there was a Dutch shop which the Dutchies on the bus enjoyed.. they bought syrups and peanut butter and were really happy! We eventually got to Wellington about 3ish and me and Gemma headed off to Te Papa museum for a look around. Its a gorgeous museum and totally interesting but massive so I will need a couple of days to do some looking around. Luckily I have the Saturday and Sunday for that. We then headed for a food court and ended up getting a big plate of Chinese food, well one little splurge! After this we wandered about then met Katie and David back at the hostel. Later on that night Katie, David and I went for a walk around town to check it out. Its a cute little city and I like it so 3 days was all good. I said my goodbyes to Katie and David and headed for bed. My little family were heading to South Island so it was the last night with them. In the early morning I said bye to Gemma, I would really miss them all. Now I am at Te Papa museum for a few hours then I will move into my next hostel. I should be seeing Nat and Nick later tonight and Ang tomorrow so I am really excited to see my pals again. Also me and Nat are hiring a car next Tuesday for 3 days until Thursday and heading to the Bay of Islands and Cape Reinga for a little road trip so I am excited about that. I also have a to do list of things to do before I head to Lima on Thursday. I cannot believe my NZ trip is almost over!! Majorly excited about SA and seeing Ellen and Aimee though so all is good. I also need to book my flight home in the next few days so its all busy busy as usual!! Anyway time to get back to the museum! Much love for now! !